Thank you for the hearts, dear DU friends. I miss them and wish they would decorate our pages a little longer! Each one was a lovely surprise! That puppy is too precious! Wishing you all many delightful experiences together! Please post more photos as he grows! We have two corgi puppies (11 months and 4 months) and feed them Purina Pro Plan (puppy food). That’s what the breeder recommended and our vet said it was “the best.” I don’t know if the pet stores carry it, but the supermarket did not. We order from Chewy.com which offers free shipping. We are on a regular delivery schedule with them. UPDATE: The power of prayer! Our puppy is now recuperating at home and getting the best of care. A week ago, his prognosis was poor, but he has been discharged from the hospital with tons of meds and instructions. I am sure the worst is behind us. He is looking much brighter and is definitely happy to be home. Thank you all for the concern and support for our family this past week. It meant so much to me to know your were pulling for him. This has been the week from hell. Wishing everyone a very happy holiday season with many blessings. Thank you , dear DU friends. One of our dogs is extremely ill. He has been in the hospital since Sunday. Please pray to St. Francis if you can, or send some good vibes for our little guy. Thank you, my dear friends. Check @WhatsPatUpTo for more information. Primary Day! Did you vote? Turnout seems very low here (District 14) I voted around 11:30 a.m. and was number 62. It's a small rural precinct though. There were no signs, no one handing out reminders, nothing. At first I thought they must have moved the polling place! Ho does it look in your neighborhoods? 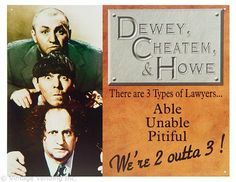 These guys will take the case! In a lengthy late-night Facebook post that name-dropped Robert Frost, Robert Kennedy and President Trump, State Sen. Daylin Leach made it official: His stalled congressional campaign is finished. Leach’s statement, which was posted online shortly after 10:30 p.m. Saturday, came a little more than two months after the Inquirer and Daily News first reported that eight women who had either worked for Leach or the Pennsylvania Democratic Party had accused the three-term senator of subjecting them to unwanted physical contact or sexually charged conversations. Some fellow Democrats, including Gov. Wolf, immediately called on Leach to resign and abandon his attempt to unseat Republican U.S. Rep. Pat Meehan in what was then the Seventh Congressional District. But Leach initially demurred, opting to announce that he was simply “taking a step back” from his campaign as he assessed the fallout from the allegations. A Wolf spokesman said the governor did not have any statement to release about Leach’s decision Sunday night. Florida students plan March For Our Lives, Mar. 24. Happy Valentine's Day, lovely Loungers! Thank you for the hearts! Thinking of you today and hope you get to spend it with someone you love! And may I add, Thank you for the Hearts! I am so happy and grateful for anyone who remembered me today.